Mona Hinze is a computer programmer living in Coppell, TX. 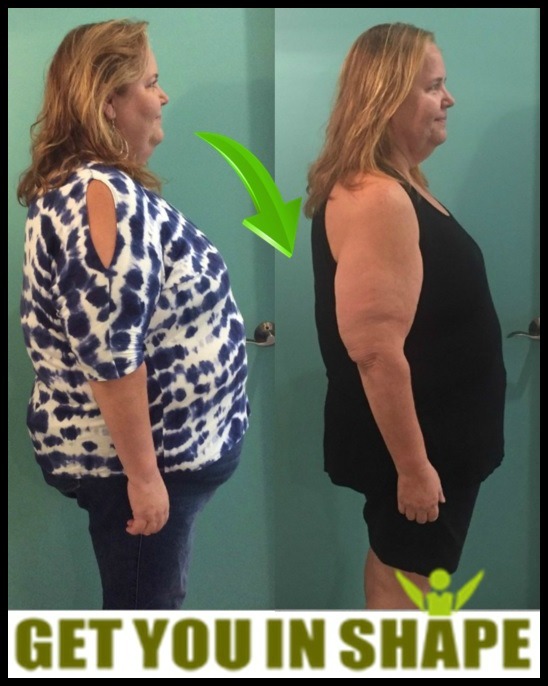 She has been part of the Get You In Shape family since October 2014. I was working out inconsistently thinking I was doing enough. I was bored with the process because it seemed like I was doing the same workout over and over. I was on/off multiple diets where I would lose a few pounds and gain back more when I was off of them. A couple of us had started working out with a trainer at another location but that trainer was constantly cancelling our sessions so we decided we needed to make a change to something that was more consistent. My friend, Alison, had been asking me to try GYIS for a while and I was just so concerned that I wouldn’t be able to keep up (or even do the exercises) that I kept putting her off. Luckily she kept on me and I am so thankful that she did!! It wasn’t as scary as I thought it would be () EVERYONE was very welcoming and I never once felt like I was slowing anyone down or that anyone was looking at the heavy girl trying to work out. I was very pleased!! I really appreciated that when the trainers gave instruction they gave multiple options that way I was able to do everything. Even though I had been working out before coming to GYIS I was still very sore!! I was using muscles that I hadn’t used in a long time and I loved that!! I needed the variety and the challenge. This is still one of the things I appreciate about the program. The Trainers – I think the trainers are the best tool. They are always so encouraging and willing to help. It always amazes me how they can keep up with knowing who everyone is. Community Support – I don’t know if this really a tool but it has been very important to me. I have made new workout friends and we help keep each other accountable. We follow up if one of us misses, we encourage each other and we push each other when necessary. MyFitnessPal – I linked with a couple of the trainers and it was helpful for them to see what I was eating and add recommendations. I even had one trainer check on me when I hadn’t logged in a while. Facebook – I have used some of the recipes and I have downloaded some of the silly motivational pictures to use as screen savers. Competitions – I don’t do them all but I have done quite a few – they have been helpful to keep me on track. I enjoyed competing against friends to see who would get 100 miles first. I like the variety of the workouts and I love that you don’t have to be in the best shape to do the work out. There are always modifications and no one cares if you are doing the modifications… they just want you moving . And the trainers notice when you start to do more… which sounds like it shouldn’t be that big of a deal but when I did start running some and it was noticed it made me feel good and it made me want to continue to improve. I can enjoy life so much more. I recently went on vacation with my son and his wife and we walked a lot of streets/hills. The first day they kept asking if I was okay? did I need to rest? but by the end of the second day my son made the comment that I had more stamina than him… loved it!! GYIS has been such a major part of my weight loss journey. I had been going back and forth losing 5 pounds then gaining it back. My one consistent has been GYIS and the support I received from the trainers and community be it monitoring my tracker, sending notes or just generally being happy that I am losing weight. I have had people that I have never met tell me good job and even comment that they noticed that I was losing weight… for me this is such motivation to continue the journey. 1. I am currently still working on one because I am still losing weight. My confidence has also increased; One of my stumbling blocks that I had for not wanting to join GYIS was being afraid of not being able to do it and what people would think when I was working out. I don’t have that holding me back anymore. I know I might not do everything perfect but I am doing it to the best of my ability and am constantly improving.